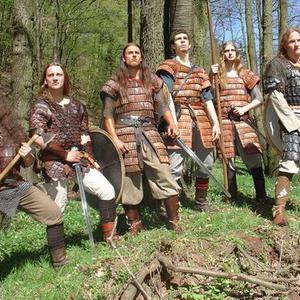 The Thuringian band Gernotshagen was founded by members of the bands "Grafen von Gleichen" and "Rocksoldiers" in 1999. Their lyrics mainly focus on myths and legends concerning their home region around the Wallenburg and the town of Trusetal. The historical context of the band's name "Gernotshagen" is that there was an ancient settlement beneath the "Wallenburger Turm", which has been the beginning of the town of Trusetal. They play folk-influenced Metal with clean and screaming vocals. The band members are B. Techet (guitars), D. M?ller (vocals), S. Beck (bass), M. Pomplun (guitars), S. Jung (keyboards), T. V?lker (drums). Two albums have been released, "Wintermythen" (2002) and "M?re aus w?ldernen Hallen" (2007). There is also a demo named "Infinitus Malum" (2001) and a DVD named "Live at Kallewerk" (2004).